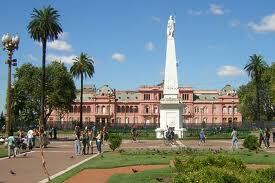 Before becoming the main stage of Argentine independence, the neighbourhood of Monserrat, with Plaza de Mayo as starting point, was the spot chosen by Juan de Garay for the city´s second founding. The firstcomer from Spain was Pedro de Mendoza, who despite his efforts for civilising the natives and organising a precarious harbour, died on his way back to his motherland, without having reached any of his goals. In 1580, Juan de Garay landed on the Río de la Plata´s shores, scarce metres from what he called the Plaza Mayor and proclaimed as the first public square. The social scene of Colonial Buenos Aires started to build itself around it: here, masses were celebrated, the first public market as well as the first bulls arena were opened and prisoners on death row were hanged. On the streets around it the first fort and temple were built to the purpose of protecting the square from being buffeted by time and battles. One of the oldest constructions stood where today stands the Metropolitan Cathedral, it was a tiny mud chapel whose first mass was attended by Juan de Garay as only witness. After the first Spanish colony settled a great congregation of Jesuit monks put into these shores intent on converting the natives. It was thus that in 1661 they settled in a convent by the Plaza Mayor. This place is called today the "Manzana de las Luces". In time, the jesuits left the country but the building stayed behind, its underground tunnels still stand. 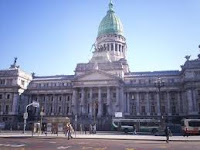 But the historic value of this area was based on the events that cemented Argentine history as a nation: the british invasions and the Mayo Revolution. The first event took place in 1806 and 1807 when English soldiers attempted to occupy these lands. On both occasions the city merchants and urban militia defeated the enemy and in this way prevented a second colonisation. 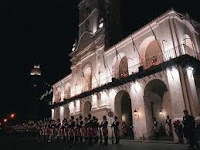 The stage for these battles was the Plaza Mayor (current "Plaza de Mayo") and buildings around it, such as the Cabildo and the San Ignacio Church. 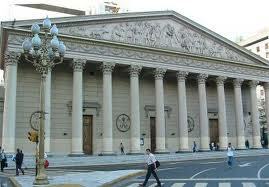 Location: To the north of Belgrano Ave. and west of Puerto Madero. Main arteries: De Mayo Ave., Rivadavia Ave., Bolívar, Belgrano Ave. and Alsina st.
How to get there: buses 130, 152, 10, 17, 22, and A subway line. Best time to visit: During daytime to take in the architecture. Neighbourhood corner: De Mayo Ave. and Bolívar.